7.17 points at 24 votes (rank 309). The years went by after our hero Thor had rescued his girlfriend in BC's Quest for Tires and his fame faded away. With ages comes wisdom - thought Thor and went out to search for the meaning of life. The legends entwine around a system of mountains, small paths and dark caves, at the end of which the meaning of life is supposed to be found. The legend also speaks of a hairy monster that collects "clams" (Stone Age currency), whose primal scream knocks even the strongest cave man from the unicycle, and of a moneygrubbing bridge attendant named Peter, that should guard the bridges between the mountains and takes plenty of clams from you to let you pass. There are also rumours of a green wheel-eating dinosaur. But in defiance of all legends Thor sits undaunted by death onto his wheel and starts the adventure. When collecting the necessary clams some problems thwart him. The steep way up the first mountain is narrow and full of boulders, stones and stalagmites. Also insurmountable holes in the ground and the hairy collector "Grog" give him a hard time. The reason is that he believes all the Stone Age money belongs only to him and has made it his business to take revenge on everyone that wants his money. Thor has hardly arrived at the first peak, when he already has to dare entering a dark tunnel, but not before switching on the light on his unicycle. In the sparse light cone he has to avoid stalagmites until he sees light at the end of the tunnel. "Phew" finally outside! But there Peter is standing and takes away his hard earned clams from our hero. If Thor wants to go over the bridge he has to pay the desired number of clams, otherwise it means to go back into the cave and collect more of them. If Thor has collected 25 clams more than necessary to get over the bridge he gets awarded an extra "Stone Age wheel" (extra life). After the bridge has been crossed, Thor starts to climb the next mountain and so his adventure continues until he has found the meaning of life. As already his forerunner BC's Quest For Tires, the game is based on the comic model B.C by Johnny Hart that was first published in the 50s. This also explains the comic look of the game. In contrast to its forerunner the colours were kept very restrained. The screen that is mainly kept in grey and blue is structured into 3 parts. The upper two thirds of the screen are the main screen, where the action takes place. The lower third of the screen is divided in two parts. In the left part you see the score and how many clams our hero and his competitor Grog have already collected. The right part of the lower area serves as radar and shows the mountain on which Thor is driving (yellow rectangle) from the side view. He can also see where his biggest enemey - the hairy Grog - is (white diamond). Because he is on the way to Thor and wants to take revenge for every single clam he has "stolen". This puts our protagonist under time pressure and gets the game something like a time limit. There is not really any music in the game, however, the comic look of the game is accompanied with many small and funny sounds. letting his wheel get eaten by the green dinosaur that he meets in the higher levels. All these causes for death are - as usual for comics - overdrawn and often make the player snort heartily with laughter! The mountains are marked A - E. On the peak of mountain E is the meaning of life. Every mountain chain is divided into different mountains (levels). Thor follows the movement of the joystick in all 8 directions. Thor drives faster as long as the fire button is pressed. The aim of the game is to finde the meaning of life. This is on the peak of the last mountain of every mountain chain. Mountain chain 1 - easy: The warp-tunnel is always directly right next to Thor's starting point. from mountain D to mountain E: you can find out yourself . 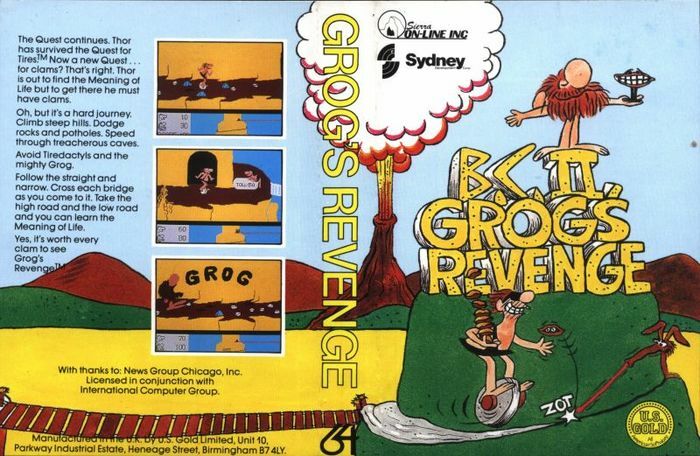 . .
Goondoc: "As it was with the forerunner BC's Quest for Tires, Grog's Revenge is also lots of fun for me. The toddling unicycle, the waving head of hair, the charming grin and the funny crashes make Thor one of the most likeable characters of all times. Unfortunately both games are rather easy to make and quickly played to the end, which somehow limits the long-termn motivation. 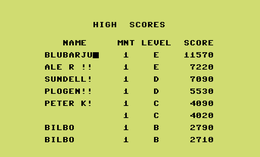 Addition: after I have just played it once again, I subscribe to Robotron2084's view, the game is too monotonous. 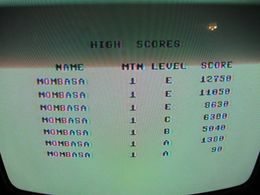 Therefore only 6 points from me. " Robotron2084: "In comparison to its forerunner Grog's Revenge distinguishs itself in my opinion by its monotony of the course of the game. You do not have to do more than collecting clams and avoiding obstacles. The charming graphics keeps the game from immersion. 5 out of 10 points." Camailleon: "The game is done nicely with its small and already mentioned funny facets. That it gets boring after a while is right, but it is the perfect game for in between and for the time when one needs a small feeling of success." Blubarju: "I like BC II as much as its forerunner. Funny graphics and soundFXs and a moderate difficulty grade. For this I give 8 points." This page was last modified on 20 July 2017, at 12:42.